Well, it's Wednesday and it's time for another Fab 'n' Funky Challenge. We have got the most amazing Host this week, and it's Me and she has picked a theme of 'Christmas in July'. What a great effort from everyone for last weeks Challenge, I thought that they were all fantastic. As with everything we must pick a Winner, so please check out the Fab 'n' Funky Challenge blog to find out if it was you. But I must thank all of you for you wonderful creations, they were all fantastic. We have a fabulous sponsors this week offering the most fantastic prizes!!! The Winner of this Prize will have A Class of the Winners Choice. 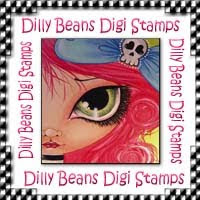 The Design Team were lucky to have images from our sponsor Dilly Beans Stamps to play with. You can interpret it as you wish, and it can include a wide range of projects. The choice is endless, but just remember to include the Theme. Have a great week everyone and I can't wait to see how you have used "Christmas in July" to create your Project this week. Gorgeous card Anne-Marie, so cute. Great card Anne Marie - just the challenge I needed to kick start my xmas collection. Anne-Marie: Your entry is beautifully done and I adore your cute penguin! Look forward to seeing your entries in our upcoming challenges too! Thank you for joining our “Christmas in July” Challenge #41 at Simply Create Too..
Anne Marie: Pretty card with the lovely doily. Thank you for joining us at “Christmas in July” Challenge #41.